Explore a wonderful world of mountains, markets and medinas on this three week grand tour of Morocco. Discover Andalucian influenced architecture in Rabat and Chefchaouen, meet the proudly independent Berbers, the masters of the Atlas mountains and spend a couple nights under the stars with desert nomads. Wander through huge souks and barter with merchants over intricately decorated artwork in the cities of Marrakech and Fes and relax by the beach at the bohemian towns of Mirleft and Essaouira. Our trip starts in Marrakech. This evening we will meet our Explore Leader who will conduct an introductory briefing and we will get to know our fellow group members. Customers arriving on earlier flights may have time to walk to the bustling Djemma-el-Fnaa square or just have a stroll around the 'Red City'. Tonight is the first opportunity to try a tagine, a slowly cooked stew which is found all over Morocco, baked in a traditional conical clay pot. We leave Marrakech early this morning and make our way to Casablanca to visit the great mosque of Hassan II. This spectacular structure is the largest mosque in Morocco and the only one open to non-Muslims; it can hold an incredible 25,000 worshippers and has a huge retractable roof. After a guided tour we will continue on our journey to Rabat, a city that's history dates back to 8BC. On arrival we will have an opportunity to explore something of the city's historic heart, with a walking tour of the area around the Hassan Tower and the Mausoleum of Mohammed V, before wandering through the blue and white walled Kasbah des Oudaias, a fortified town infused with a distinctly Andalucian flavour. Today we head into the mountains and drive to Chefchaouen, a historical town known for its Andalucian influenced medina with red tiled roofs and buildings that are painted pure whitewash or an electric blue. Upon arrival we will explore the medina, scramble up the battlements of the 15th century kasbah and spend some time browsing the market in the Uta Lhmam square, which is the centre of the town. As well as the historical interest and aesthetic beauty of the architecture, one of the best parts of walking around Chefchaouen is the views over the fertile plains beneath the Rif Mountains. Walking round the town is a good time to try some mint tea, this incredibly sweet drink is found all over Morocco and it's probably a good idea to get used to it quickly, as it is unavoidable! spectacular centrepiece, the Bab Mansour, en route to the Place el Hedim and the city's medina, where we can try our bartering skills in the busy markets. It is then an hour's drive to Fes where we will stay for two nights. We have a full day today to take in the artisan capital of Morocco and during the morning's sightseeing we will view the Royal Palace and drive out to North Bori for some great views back across the city. Craftwork made and sold in the Fes medina is considered amongst the finest in Morocco and a wander through its artisan districts reveal weavers and brass workshops, coppersmiths and tanners, producing beautiful pieces much as they have for generations. After lunch our exploration of the city continues with a tour of Fes El Bali (Old Fes), exploring the souks in the backstreets, wandering past the spice stalls and taking in the luxurious majesty of the 14th century Attarin Madrasa whose intricate decoration and elegant design makes it one of the city's most captivating medieval colleges. As we walk through the market we smell freshly cooked baghrir, or Berber pancakes and we can try Harira soup, a tasty broth made from chickpeas, tomatoes and Moroccan spices. Today we have a full day driving as we climb steadily into the dramatic landscapes of the Middle Atlas, passing near the small mountain village of Azrou, which in the Berber tongue translates as 'the rock'. This is the land of the fiercely independent Berbers, the Lords of the Atlas, whose traditions and ways still hold sway up here in their mountain strongholds far away from the cities below. The Berbers present us with a special view of a way of life lost to the rest of North Africa, where music and dance, even language and religion, are far removed from their Arab neighbours. Continuing into Berber sheep raising country we traverse a broad plateau past Meski Oasis, the so-called 'Blue Spring' bordering the arid desert plains, from where our journey brings us at last on to the desert settlement of Erfoud, our base for the night. Our day starts by following the meandering Ziz River towards Rissani, the last sizeable community and the end of the vegetation belt before the dunes of the sand sea begin. The settlement is the homeland of the Alaouite dynasty, which reigned in this region for 300 years, and this morning we'll have an opportunity to visit the founder's mausoleum and explore something of the local ksour (fortified villages). After lunch, we then drive on to the settlement of Merzouga, which lies on the edge of Erg Chebbi, an area of high dunes that are amongst some of Morocco's most spectacular natural landscapes. To get to our camp we will ride camels, those not wanting to ride can walk alongside. There is also the option of taking a 4WD to camp if needed. Tonight we stay in a traditional nomad camp with large tents sleeping 3-5 per people each, the camp will also have a restaurant tent where we will eat dinner and breakfast, prepared by our camp crew. All bedding is provided at camp. We recommend getting up early this morning to take a short walk to the top of the nearest dune to witness the sun rise; there is nothing like seeing the light of the sun spread over the vastness of the desert. Watching as the sand turns from a dark greyish colour to brilliant gold as the sun's rays touches it. After breakfast we make our way back to Merzouga (either by camel or 4WD), board our bus and travel along the southern slopes of the High Atlas on our way to the Todra Gorge. The landscapes continues to change as sand dunes give way to hills which then start to turn green with a more tropical feel as we approach the town of Tinghir. We will stop here for a chance to have a walk around the huge date palm forest that skirts the town, after spending the night in the desert it is quite surreal to walk amongst lush palms trees a few hours later. We continue to our hotel in the upper Todra Valley where we will spend two nights. Today we will explore the Todra Gorge where dramatic ochre-coloured cliffs rise vertically to leave just a narrow pass through which our track and the river struggle for right of way. In the morning Berber women drive their goats through the narrow gorge to the better grazing land higher up and we have an opportunity to follow their daily ritual and take in the stunning views, as we spend the morning exploring these deep, narrow mountain chasms on foot. You may choose to join your Explore Leader on an optional walk to Abdelali viewpoint for some excellent panoramas across to the Jebel Sahro and down into the gorge. The walk generally takes around 5 hours in total and is considered a moderate graded trek, but be aware that in high temperatures it can be more demanding (walking boots with ankle support are essential). Alternatively you may opt to explore the valley floor following the path of the river and take in the local scenery from one of the nearby cafés. This morning we drive west, where we make a short stop in El Kelaa des M'Gouna positioned at the foot of a rocky outcrop that separates the Dades and Mgoun Valleys. Famed for its roses, the town lies blanketed under a landscape of scented blooms each spring, which are then harvested in May during the famous Festival of the Roses and processed into rosewater to be sold throughout the Islamic world. Driving on through the Dades Valley with its fertile oases, we enter the Valley of a Thousand Kasbahs, where each of the oasis towns can boast their own distinctive character, the mud and straw structures becoming more plentiful and more ornate as we progress along the valley. Later this afternoon we make our way towards the small, fortified Berber settlement of Ait Ben Haddou, which has been classified as a UNESCO World Heritage Site and is considered by many to be one of Morocco's most picturesque settings. Studded with crenelated towers and richly decorated, the town's kasbah is quite spectacular and provided an ideal location for filming scenes from Jesus of Nazareth and Lawrence of Arabia. After exploring the kasbah it is a short drive to the desert outpost of Ouarzazate where we stay the night. Today we head back into the desert and drive through the beautiful and fertile Draa Valley. Our route is lined with palm groves, with many kasbahs and ksours (villages) punctuating the impressive landscape on the way for a quick stop at a pottery cooperative in Tamgroute, a historical town featuring a 15th century library which contains books spanning back over 700 years. We will visit the library and then continue to Mhamid and board 4WD jeeps on our way to the towering Erg Chegaga sand dunes of the Sahara Desert. After arriving into camp our leader will take us on a walk up the dunes for panoramic views and to learn a bit more about the flora and fauna found in the desert. Our camp tonight is a traditional nomad camp with large tents sleeping 3-5 people each, the camp will also have a restaurant tent where we will eat dinner and breakfast, prepared by our camp crew. All bedding is provided at camp. We leave camp after breakfast, get in the 4WD and take a wilderness drive across the desert to the oasis town of Foum Zguid. This is a 90km drive but will take between three to four hours as we are off road and on desert tracks. Though the going is at times bumpy, this drive is a real adventure and we will barely see any human activity, even the camels here are wild. At Foum Zguid we will get back in the bus and make our way to Tata, stopping on the way at Tissinnt, where there is a large gorge filled by a lake which ends in a waterfall. The falls may not have a wow factor but there are often nomads in the area collecting water and we may have a chance to meet them. Our destination tonight is Tata, and depending on our arrival time there should be an opportunity to explore the town, with its pink buildings and laid back character. Day 13 - Cross the desolate Anti-Atlas and drive to Mirleft on the Atlantic coast. This morning we drive through the Anti-Atlas, a wild and barren world of rocky outcrops and remote, desolate landscapes. We pass primitive villages, consisting of a few small homes surround by palm trees, life in this area is tough as water is scarce and farming difficult. The main town in this region is Goulemin, known as the gateway of the Sahara; we will stop in the town for lunch and for a short walk through the Taghjijt Valley, a rare oasis of green lush date palms. Taghjijt is known for its high quality dates and there will be an opportunity to buy some from a local farmer. Our drive continues towards the Atlantic Ocean and as we get closer to the coast we notice the scenery becoming greener and brighter, our destination is Mirleft, a small town set just off the coast where we will spend two nights. Our accommodation is set in a rural area with coastal views just a short drive away from the town. Upon arrival there will be free time to take a ten minute stroll down to the beach or relax by the pool, before having dinner. Today is free to spend at leisure in Mirleft. Mirleft has gained a reputation as a bohemian town thanks to its popularity with artists, musicians and travellers; meaning there is a burgeoning café culture and a surf scene that is growing in popularity. Your Explore Leader will talk you through the options for today, which include swimming, having a surfing lesson or to just relax around the town, and assist with getting to and from the town twenty minutes away. 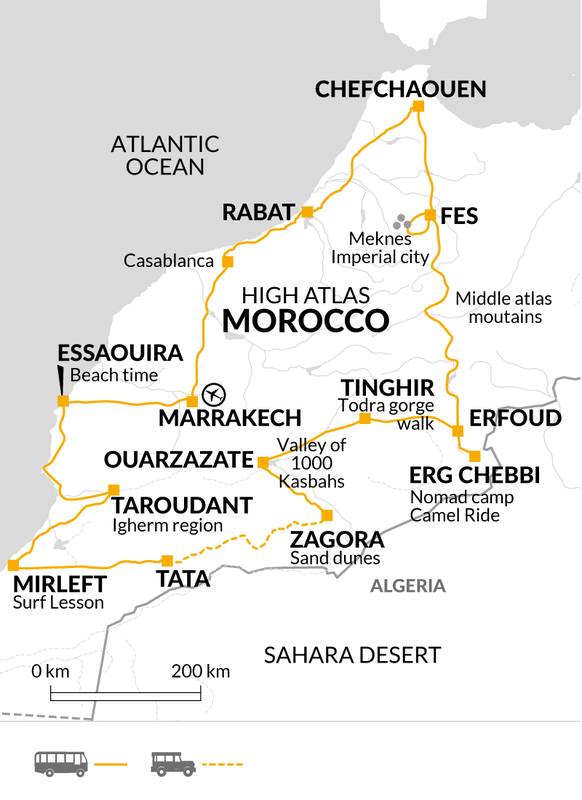 We drive north today through the fertile Sous Valley, passing forests and plantations; this area of Morocco has a more relaxed feel and we will find local people particularly welcoming and happy to see visitors. Our first stop is the Sous- Massa National Park, which is a large reserve situated between the estuary of the Sous-Massa River and the Atlantic Ocean, where we will enjoy a couple hours of walking. The park has seven traditional Berber villages but the main attraction is the birdlife, and it's in this area that we may be lucky enough to see the Bald Ibis. We will also see flamingos and there are some old fisherman caves which can be also explored. We make our way to Taroudant, the former capital of the south of Morocco, on arrival our Leader will take us on an orientation tour of the town. Taroudant is enclosed by a huge rectangle of golden fortified walls, dotted with towers which are still in good repair and are an impressive sight. We will explore the market, where there are lots of small food stalls selling cooked meats and flat breads, filling the air with smoky barbeque aromas. Our destination today is the historic seaport of Essaouira, a small town on the Atlantic coast where we will spend the next two nights. It will take us around four hours to drive to Essaouira and once we arrive we will find a local restaurant to have lunch, seafood is the predominant ingredient here, eaten by tagine or grilled over charcoal. After lunch our Leader will take us on a walking tour, ensuring we have our bearings for a free day tomorrow. The town is encircled by 18th century battlements and we will explore the old walled medina, passing through the narrow, highly decorated arched entrance to find a host of merchants selling local handicrafts and women carrying out their daily routines, veiled in their traditional dress. Today is free to spend at leisure in Essaouira. Just south of the town there is a long sandy beach which is slightly sheltered from sea-wind and depending on the time of the year the water is great for swimming (it might be a bit cold in the winter). Other things to do here are to wander around the harbour, with its famous blue boats; explore the Jewish quarter and shop in the various laid back souks and markets. This morning we leave the coast and return to Marrakech. It's a few hours' drive and after we have checked in to the hotel we will take a walking tour of the Red City. Like many North African towns, Marrakech is divided into two distinct parts, the Gueliz (the modern French-built city) and the Medina (the Old City), a place where trade and barter amongst the colourful souks still renders its ancient heart a glittering cacophony of noise and colour. The city's beating heart is the spectacular Djemma-el-Fnaa, a site not to be missed and a scene straight out of the pages of the Arabian Nights. Here we will find the streets and alleys alive with storytellers and musicians, jugglers and acrobats and clowns. Marrakech is a city like no other; with a staggering array of spectacular architecture and wonderful facades; not to be missed are the Koutoubia Mosque and tower, Saadian Tombs, Ben Youssef Madrasa , the Dar Si Said Palace (now the Museum of Moroccan Art) and the Menara gardens. This evening there is also an opportunity to visit a traditional hammam. Summer: Clothing should be lightweight. However, a warm sweater is also advisable, as the desert can sometimes get cold at nights, even in the summer. Winter: Usually warm during the day but thicker clothing is essential for cold nights (Nov-Mar). It is advisable to take warm clothing (eg. track suit or thermal underwear) to sleep in, as the quality of heating in Moroccan hotel rooms can be variable. A waterproof jacket, trousers and fleece are recommended in the winter months. Morocco is a Muslim country and it is important to dress with respect for local customs. People may be offended by shorts or revealing dresses, which can attract unwelcome attention. We advise that in general both men and women should cover shoulders, upper arms and knees. Transparent, plunging necklines and tightfitting clothes should be avoided. Women should also cover their heads when entering a sanctuary, though in general, mosques are forbidden to non-Muslims. For those clients on a cycling holiday please bear this information in mind for times that you are not on the bikes. While cycling it is no problem for both men and women to wear your regular cycling gear, tight fitting or not. We recommend sandals and walking boots with good ankle support if planning to do the Abdelali walk in the Todra Gorge. A head torch, water bottle, sunhat and high factor sunscreen are all essential, whilst we recommend swimming costumes and towels. Accordingly, you should allow approx. £45 per person for tipping of crew and local guides used. Morocco is a developing country and as such, the accommodation standards are not equivalent to those in Europe and can be more basic. We generally choose our properties because of their location, cleanliness, traditional style or for their welcoming atmosphere, as we endeavour to provide an authentic Moroccan experience. However, some of the properties might have some outdated or simple furniture and the level of service may vary depending on the location. You may find that availability of hot water is variable or limited in certain locations. Breakfasts are generally continental style. A swimming pool is often available, especially in the cities. This three week adventure is perfect for travellers with more time to spare and who want to really get under the skin of Morocco. It is the most explorative trip of Morocco in the market, whilst still seeing all the historical highlights in this beautiful and tranquil country.